As more states and cities set aggressive policies toward a carbon-free future, the energy industry is abuzz with the concept of electrification. What does this have to do with energy efficiency? A lot! 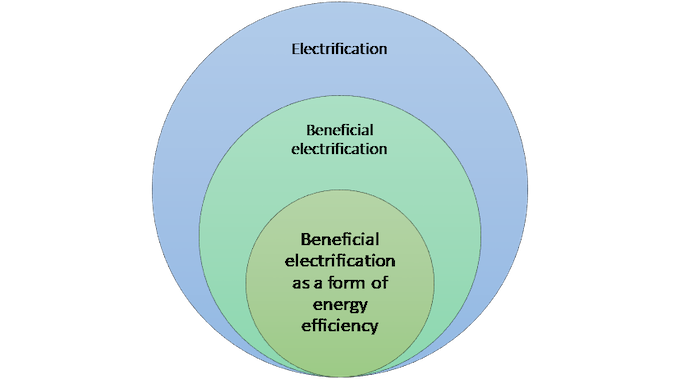 Although some people may assume that efficiency’s reduction in electric use conflicts with electrification’s increase in load, in fact, energy efficiency is central to many electrification strategies. Like many relationships, it’s complicated. If done right, electrification presents opportunities to advance energy efficiency and its many benefits. But if not done carefully, it also poses challenges. Here we briefly explore the relationship between electrification and efficiency and highlight some upcoming American Council for an Energy-Efficient Economy (ACEEE) research and outreach that will further explore the topic. What technologies bring together efficiency and electrification? A growing set of energy-efficient technologies are types of electrification, including electric vehicles (EVs) and high-efficiency heat pumps for space and water heating. For the fourth consecutive year, electric vehicles dominated ACEEE’s Greenercars.org 2019 “Greenest list,” which consists completely of vehicles with some form of electric powertrain. Last year we also examined strategies for integrating electric vehicles into the grid and hosted a convening on the topic. This year we will continue to examine EVs’ efficiency opportunities through research, outreach, and convenings, including a utility working group that will explore equity issues in EV deployment and integration. In the residential buildings sector, we published research last year that found that switching from propane or oil heating to high-efficiency heat pumps can often lower homeowners’ costs, save energy, and reduce emissions in most regions of the country. But as our previous research found, switching from natural gas to electric systems is currently cost-effective from a consumer perspective only in certain parts of the country. And the economics of electrifying residential buildings will generally be more favorable in new construction than retrofits (see here) based on current economics. Commercial buildings and the industrial sector are areas for more exploration. As Lawrence Berkeley National Laboratory (LBNL) examined in research last year, industrial applications are much more complex due to diversity of processes and higher levels of process integration. In 2019, ACEEE will conduct research on electrification and decarbonization opportunities in the industrial sector. We are also interested in assessing commercial building market segments that present the most promising near-term opportunities for cost-effective potential. Some observers falsely view electrification as being at odds with efficiency, questioning why we should pursue efficiency policies to reduce kilowatt hours if we also pursue electrification to increase kilowatt hours. But this misses the bigger picture that both efficiency and electrification can reduce fossil fuel use, costs, and emissions. In fact, efficiency policies become even more important in helping to ensure that increases in electric load from beneficial electrification do not unnecessarily increase electric supply costs or electric system emissions. And from a societal perspective we need large amounts of energy efficiency in the buildings, industry, and transportation sector to meet climate goals. Take energy efficiency resource standards (EERS) as one policy example. These set long-term energy savings targets for utilities to meet a portion of their energy resource needs with low-cost investments in efficiency programs for customers instead of supply. These programs can also support buildings’ electrification when in the public interest by, for example, installing heat pumps to replace oil or propane heat. Massachusetts’ new three-year energy efficiency targetsprovide an example. The new targets use multiple metrics to achieve multiple goals, including electricity savings, more-aggressive natural gas savings, and a multi-fuel target set in Btus. Efficiency policies such as those in Massachusetts can be a foundation to leverage beneficial electrification. But good analysis is needed to determine the balance of costs and benefits for different applications and to make sure that targets are aligned with potential savings. This year, our research will examine how the next generation of energy efficiency resource standards are evolving to respond to interest in beneficial electrification, more aggressive climate and decarbonization polices, calls for improving benefits to underserved communities, and other trends. Energy efficiency can be a foundational policy in in all such cases. Much work remains to modernize traditional utility business models to encourage energy efficiency, including revenue decoupling and performance incentive mechanisms. Interest in beneficial electrification should not mislead stakeholders into believing that we need to “recouple” utility revenues with load growth, as analysts at National Resources Defense Council (NRDC) point out. Many challenges lie ahead with electrification, including its impacts on the grid and how they will vary by region, time of day, and season, whether the economics will be favorable for customers, and its impacts on equity. For example, EVs will place a large amount of load on the grid, including during peak times, that could increase costs. Utility resource plans will need to understand when and where that load shows up in the distribution system and adjust resource needs in response. Strategies such as off-peak charging and managed charging can guide new load in a way that reduces risks and costs for utilities and their ratepayers. The same applies to use of heat pumps, which can increase early morning winter peaks. Another important challenge is that electric utilities have an inherent interest in electrification because it increases load, but they do not traditionally have a business interest in efficiency (except where policies such as EERS and utility EE performance incentives have made progress on this front). This means we will need new policies such as separate transportation electrification programs and multiple goals within energy efficiency policies to properly align utility business interests with public policies and consumer benefits. And of course, there are major challenges from the oil industry, which has frequently opposed either more energy-efficient or electrified transportation systems. We’ve seen its efforts to undercut national fuel economy standards and can expect the same against electrification policies. With such a complex and wide-ranging topic there are no simple solutions. Each state and city will need its own assessment of opportunities for beneficial electrification and its connection with energy efficiency policies. Comprehensive analysis and stakeholder engagement will serve as pillars to ensure strong policies. This can help the relationship between electrification and efficiency go from “it’s complicated” to one that’s enduring and aligned toward common goals for a clean and affordable energy future. This article was written by Maggie Molina and originally published by ACEEE.